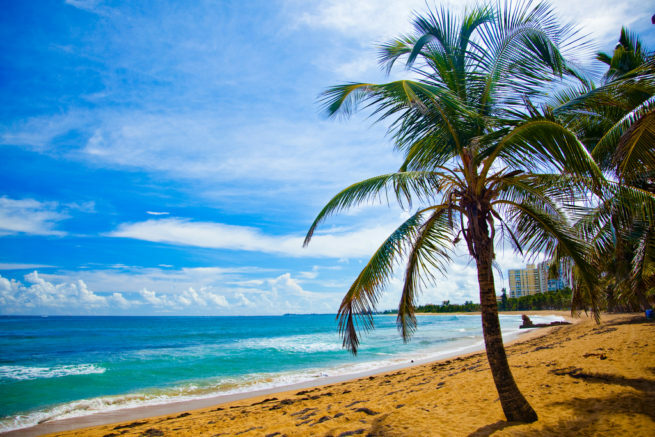 Fly private to Puerto Rico using our on-demand air charter service. Puerto Rico is a Caribbean island located 1,150 miles southeast of Florida, and it is a self-governing commonwealth of the United States of America. Home to beautiful mountains, waterfalls and the El Yunque tropical rainforest, it’s a popular destination for leisure charter flights, and a popular private route between Florida and the island. Whether you’re planning for a luxurious island getaway or a romantic honeymoon in San Juan, our flight support team is standing by to assist you with your private aviation arrangements. Below you will find a list of the top luxury hotels in Puerto Rico. We mainly have selected options in the San Juan area as this is the most visited by vacationers. These include Luxury Hotels in San Juan, Old San Juan, El Yanque, Arecibo, Aguadilla, and the surrounding areas for your vacation. Want to make the most out of your luxurious getaway to Puerto Rico? Our friends at Paradise Villas & Vacations offer our private jet charter clients the opportunity to match their luxury air travel with a luxury villa during their stay near San Juan. Guests can stay in beautiful locations, including the Dorado Beach Resort, Embassy Suites Resort, Lakeside Villas, and Cerro Gordo Beach. Choose between over four dozen villas ranging from spacious Mediterranean-style vacation homes on the beach to exclusive tropical-island enclaves surrounded by lakes and fountains. Click the button below for more details. The attractions around Puerto Rico are some of the most incredible experiences you may enjoy. There are many historic sites, cathedrals, and fortresses to explore on your trip. The National Yunque Rainforest has many waterfalls and rivers, as well as a trolley tour. There are numerous caves to tour with sights that will simply take your breath away. Many organizations have set up tours and adventure packages set up for these sites. The San Juan Fortress is one of the many historic fortresses built and run by Spaniards during times of War. Since then, it has been closed down, and re-opened as a tourist attraction. Take some time out of your day to walk the stone paths of a timeless part of Spanish history. Website: Aventuras Tierra Adentro, Inc.
For a lovely and secluded spot for sunbathing, snorkeling, and swimming, make a trip to Flamenco beach. Its white sands and warm waters make it one of the top 10 beaches of the world. The city of Old San Juan is so large, you will need more than a day to thoroughly enjoy all it has to offer. From sight-seeing to historic sites, from parks to gift shops, Old San Juan is flourished with something for everyone. This fort is built with three levels, each one distinctive from the other. From the bottom to the top, you can get an amazing view of San Juan for miles out. There are also exhibits and artifacts in many of the rooms in the fort. The Rio Camuy Caves are a spectacular experience if you have a chance to visit. The views are simply breathtaking and offer some great photo opportunities. Do not pass on this park during your trip to San Juan, Puerto Rico. La Cueva del Indio is a great chance to climb down into one of the caves of Puerto Rico. Inside, there are many rock carvings and bats to observe. Outside and a top the cliffs, the view is simply beautiful. Plus, they’re great for jumping off of into the water below. The Icacos Island is a beautiful island off the shore of Puerto Rico that’s easy to reach by water taxi. It’s very secluded, and usually not very crowded. It’s a wonderful way to spend the day. The Paseo de la Princesa is a great spot for a stroll. There are many sights to take it, great views of the old city gate and other monuments, and a large fountain to help cool off during the hotter days. Are you interested in adding another island to your trip itinerary? Puerto Rico Jet Charter can add charter flights to the Caribbean destination of your choice, allowing you to get the most out of your trip. Request a Quote or give us a call at 1-888-987-5387 to speak with one of our Puerto Rico Private Jet Charter brokers to discuss all of the options for your luxury private flight to Puerto Rico.